nancye's art and beautiful junk: Ready for Radiation? Next week I begin the journey of radiation. 35 days straight with weekends off. Kind of like a job. What I hated the most about the cancer was the chemicals. I quit smoking about 25 years ago and since then the most harmful thing I have done to myself is to worry and eat sugar. Which by the way, I am working on even now. During the cancer I had practically no sugar but every once in a while now I crave it and have some. So radiation...I have the information they gave me to make me aware of side effects. I know that everyone is different and unique and everyone handles things in their own way. I think what bothers me is possible real bad side effects. I don't mind be tired. I can sleep when I want. I am not working so other than raising my little grandson, I can take naps. And besides, my health has been a top priority for the last 7 months. So tomorrow I start the last step of this journey and after 35 treatments I will be done. Continue to pray for as I am still on the journey. Will be thinking of you and hope this goes by very quickly for you....nothing but good and positive thoughts! I'm praying for you too Nancye. I hear you on the sugar cravings, that's the toughest for me. Are you taking Vitamin D? I've been reading some incredible studies about it concerning cancer research. Ask you doctor if you get a chance, and see what he thinks. Hang in there girl, and think positive. I wish you a a travel without too many sideeffects, and that the radiation makes a good job on you. I can feel the love from all of you!!! You got my prayers Nancy. Only 35 days more to go and they will go before you know it. Hang in there. I am praying for you. 35 treatments is NOT easy. I admire what you are doing to regain your health. You have a tremendous inner strength. Thank you for sharing this difficult journey with us. You are loved and cared for by people who have never met you face to face. Thank you so much. I go into each next step not knowing what it will be. sometimes I feel I have little faith but as I look back and ahead I think I must have faith to go there. I know that this is my journey and that each of us is totally different and experiences every event according to our own lens.What lies before me is conditional on what lies within me. I just keep going. I care deeply for all my friends here online and appreciate every comment and prayer. Nancy your doll class as inspired me a lot, and your are an inspiration to your many online friends. Your great inner strength will see you thru your journey. 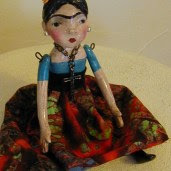 Hi Nancye, im new at your art doll group, only now i see this ms..i hope everything ok. How you feeling now?